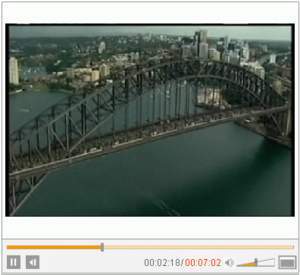 Iconic Sydney Harbour Bridge Transformed Into World's Greatest Picnic Spot! SYDNEY, AUSTRALIA--(Marketwire - October 11, 2010) - On a once-in-a-century date, October 10, 2010 (10/10/10), Sydney's iconic Harbour Bridge was transformed into the world's greatest picnic spot! More than seven thousand people enjoyed breakfast with a spectacular harbour view, whilst being suspended 50 metres above the water. Breakfast on the Bridge is the centrepiece of the annual Crave Sydney International Food Festival, a month long celebration offering extraordinary food experiences in unique Sydney locations, in all corners of Australia's global city and across New South Wales (NSW). Demonstrating Sydney's support of Australia's 2022 FIFA World Cup bid, a four metre high, giant 'Come Play' football was rolled down the center of the Australian landmark. Among the excited picnic-goers were members of Australia's national football team, the Qantas Socceroos, who played a friendly international match against Paraguay at the Sydney Football Stadium the night before, and some of the best local and international chefs taking part in the Crave Sydney International Food Festival events. FFA Chairman Frank Lowy said, "It is terrific to see that one of Australia's most iconic landmarks, the Sydney Harbour Bridge, has been transformed into a football pitch to show our nation's united support for our bid. I am delighted to see so many football supporters here today to send a strong message around the world -- we want to host the 2022 FIFA World Cup." "A FIFA World Cup in Australia will be fun, relaxed, safe and secure. We want the world's greatest sporting event, the FIFA World Cup, come to our shores. We invite the world to Come Play! in Australia," said Mr. Lowy. Premier of New South Wales Kristina Keneally said, "Breakfast on the Bridge is the hero event of the Crave Sydney International Food Festival and highlights our city's passion for food and love for the great outdoors." "The festival is a key part of the NSW events calendar and Breakfast on the Bridge is an amazing event experience -- where else in the world can you picnic on fresh green grass on the country's icon, above such a majestic harbour?" Premier Keneally said. Over 200,000 NSW residents were interested in securing one of the 6,000 spots for the public at the Sydney event with up to 1,000 interstate and overseas visitors also taking part in the event. 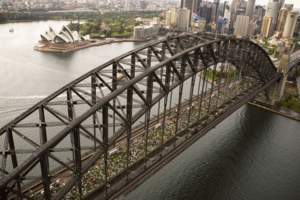 The world renowned 'coathanger' bridge was covered in 11,000 square metres of turf which will now be relocated to a Sydney park. Sydney was recently voted the World's Best Festival and Events City and has plenty more major event announcements coming up. Iconic Sydney Harbour Bridge Transformed Into The World's Greatest Picnic Spot!